When Hapkido Founder DoJuNim Ji, Han Jae moved to the U.S. in the mid 1980’s, Grand Master Ken MacKenzie, already an accomplished black belt and dojang owner, was among the first to attach himself as a loyal disciple. Dedicated to learning the evolved system of SinMoo Hapkido, GM MacKenzie accompanied DoJuNim Ji around the world gaining knowledge and skill-sets in their purest form. In recent decades, DoJuNim Ji has called GM MacKenzie his “American Son”, and has bestowed the title of “Chung Kwan Day Son Sah” upon him. With affiliated schools worldwide, GM MacKenzie is the President of the World Sin Moo Hapkido Federation, Sin-Moo Hapkido’s world governing body. “As masters and curators to our styles, it is incumbent upon us to maintain the richness and content of our traditional martial arts in their entirety”, GM MacKenzie shares. Beyond serving DoJuNim Ji, instructing international seminars, and running his four professional dojangs, it is teaching quality and true Korean Martial Arts that fuel this grandmaster. In particular, it is the sharing of the joys and riches of both traditional Hapkido and traditional TaeKwon-Do with young people that motivates him. 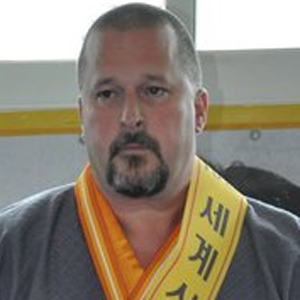 One of the very few men promoted to tenth degree by DoJuNim Ji, Han Jae, Grand Master MacKenzie’s mission has expanded to preparing the next generation to lead and indeed to continue the cycle. He works daily on the development of tomorrow’s leaders, so that they may carry the torch yet further, serving humanity deep into the 21st Century. GM MacKenzie has been on the cover of TaeKwon-Do Times in 2009, 2010, 2013, & 2014, as well as the Eagle-Express trade magazine in 2010.